Extraordinary results at the Saturday March 12 auction at PF Windibank in Dorking when a 24-lot collection of antiquities sold for a total hammer price nearly £22,000. The buyer’s premium was 20%. Fifteen of the lots were Egyptian antiquities with objects and dates ranging from ointment jars (4500 BC to 3800 BC) found at Abydos to a necklace from the Middle Empire 19th Dynasty (1400 BC-1300 BC). 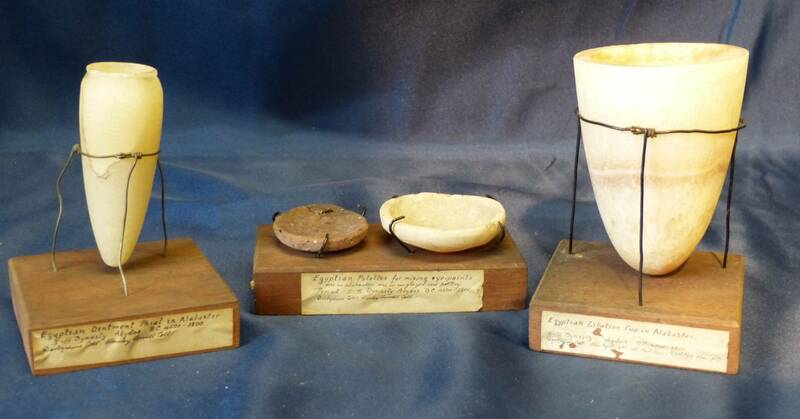 Lot 807 was a set of three ointment pots in alabaster with lids from the 1-3 Dynasty (4500 BC - £3800 BC) sold for £2600. 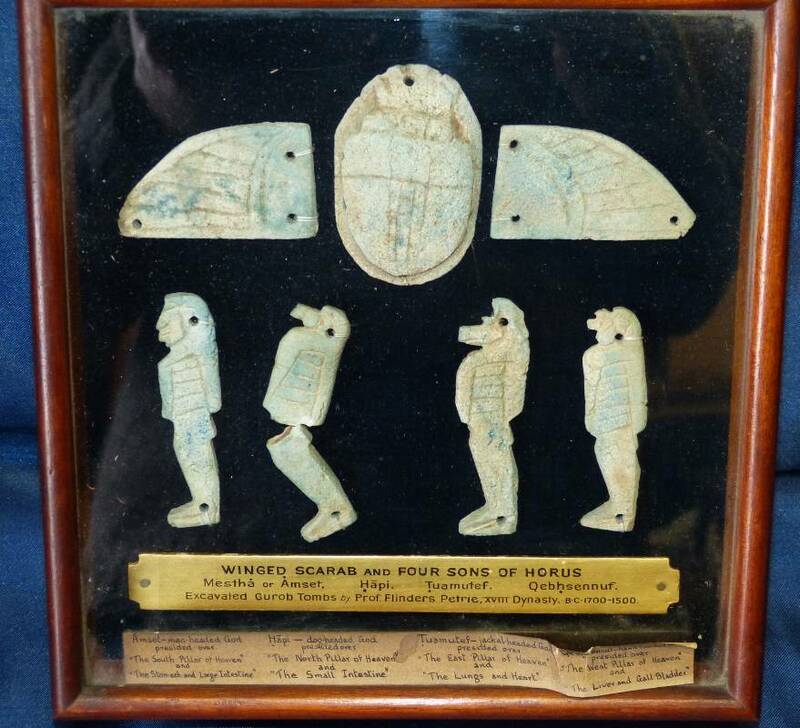 Selling for £2300 was a cased set of a Winged Scarab and four Sons of Horus, lot 816, excavated at the Gurob Tombs dating from the 18th Dynasty 1700 BC – 1500 BC. Lot 806, more alabaster pots, made for holding eye and face paint, went for £2150. Lots 803 and 812 each sold for £1600, the former including a libation cup and ointment pots; the latter consisting of glass slides containing fabric, and other items. 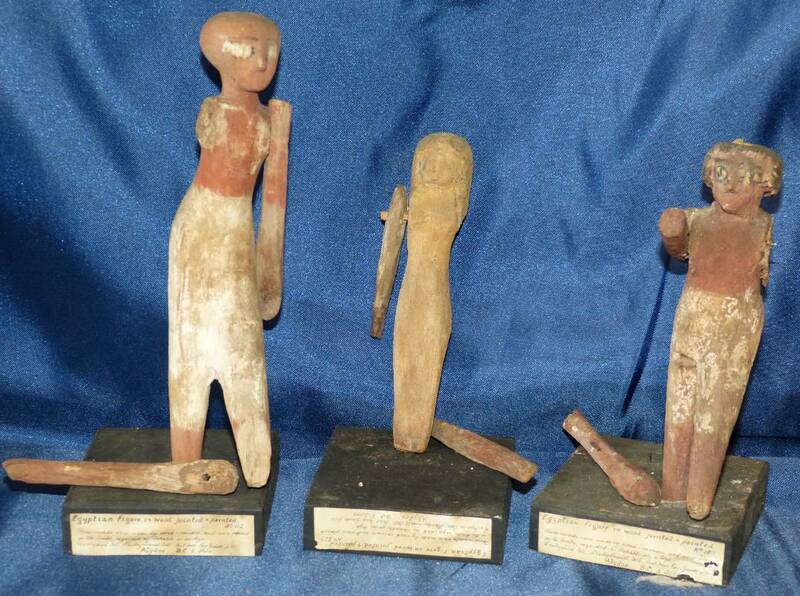 A set of three carved wooden jointed and painted figures (Lot 811) sold for £1150. A 46cm long bronze Roman ladle (600 BC – 300 AD) brought in £1250. Eight reserved telephone lines, numerous commission bids, and several serious bidders in the saleroom made for an exciting afternoon. Just over half the lots went to a private collector. Walter J Dilling (1886-1950) was a pharmacologist and physiologist who spent most of his career at the University of Liverpool. According to the vendor, a distant relation of Dilling, the items making up the collection were excavated in Egypt in the 1920s by a team from the University of Liverpool. Family lore has it that Dilling purchased the items from the University’s museum in the 1930s and 1940s. The items have been in private hands since that time and have, for the past several decades, been kept in boxes, tucked away in wardrobes by family members.